Look at any (non-vegetarian) cookbook and you’ll see one ingredient that is used in just about every recipe that is a soup, has a sauce, or a gravy. Chicken broth. 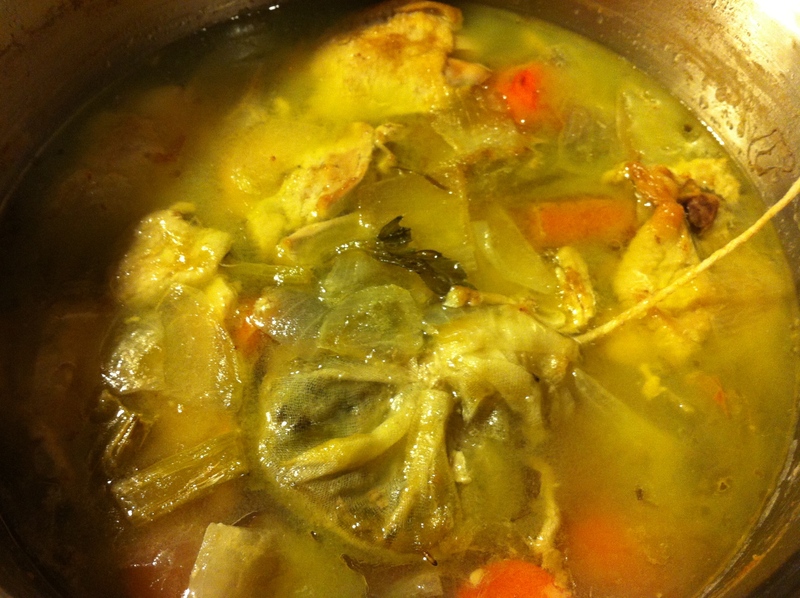 Chicken broth is used mainly for its rather chameleon-like ability to take on the flavor of most dishes. The flavor is neutral enough to not interfere with the other flavors; rather, it enhances them. It can be used in vegetable, pork, lamb (depending on the recipe), and, of course, chicken. 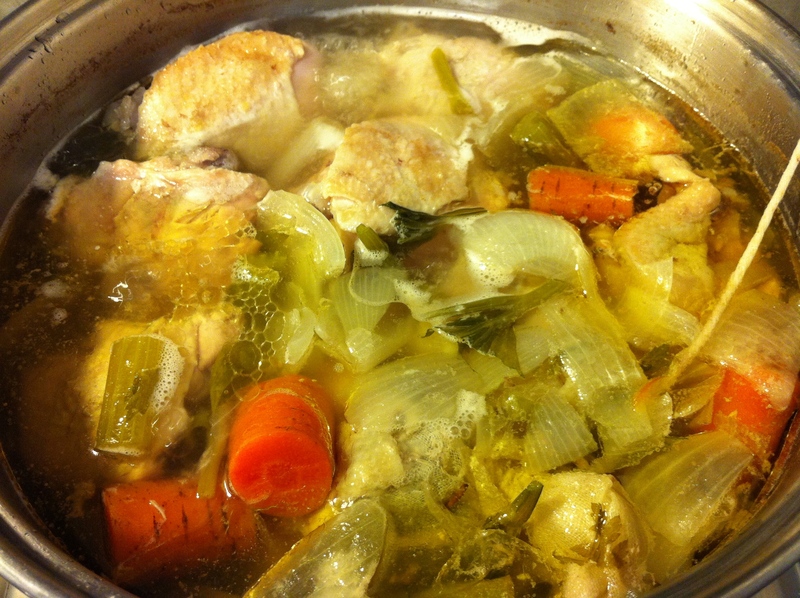 In fact, in many recipes that call for water, I’ll use chicken stock instead if I can. It just makes everything taste better. But, while a good sauce or gravy can cover up many sins in the kitchen, the sauce or gravy needs to taste just that much better. So, if you’re using bad stock, there is nothing you can do to hide that. The words “stock” and “broth” are generally used interchangeably. Because, well, they’re almost exactly the same thing. Basically, the difference between the two is one of use or intent. “Broth” is what you end up with at the end of cooking the ingredients; “Stock” is what you use to cook with. Other definitions will say that a “Stock” is always made with bones while a “Broth” isn’t. And, indeed, there is a very different “mouth feel “(a technical term used by chefs to describe taste and texture of an ingredient) between the two. But, whatever you term it, a stock or broth can make or break a recipe. A good stock will enhance; a bad stock will ruin. There’s no hiding it. There are literally dozens of commercial chicken stocks/broths on the market. Swanson’s (my personal favorite among the lot), Pacific, Kitchen Basics, and Better than Bouillon are a few that come to mind. Many stores, like Central Market (TX), Whole Foods, Trader Joe’s, etc. will have their own brands as well. You can find regular, organic, low sodium, and even flavored commercial stocks/broths now. However, I always recommend one thing when buying stock/broth from the grocery store. Avoid bouillon like the plague. It’s little more than tiny blocks of salt with a little artificial flavor enhancement. 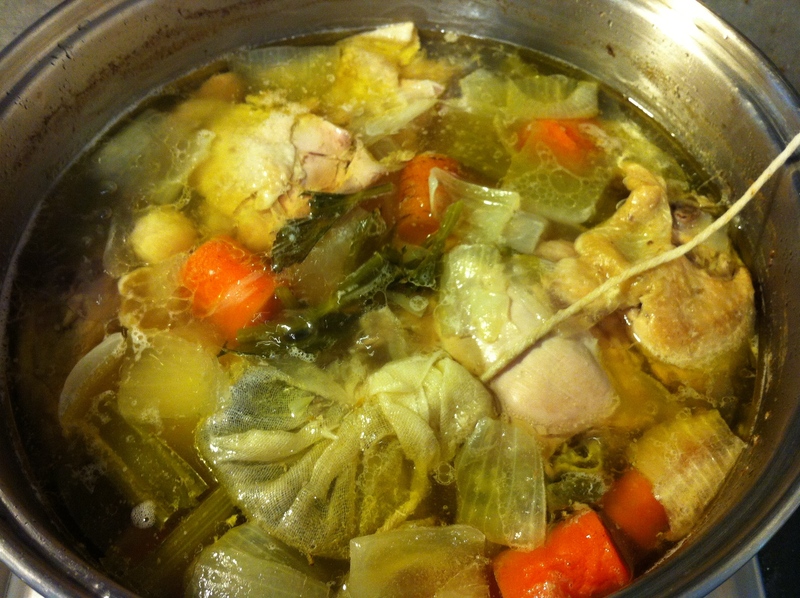 As good as some commercial stocks/broths are, there is really nothing to compare to homemade. 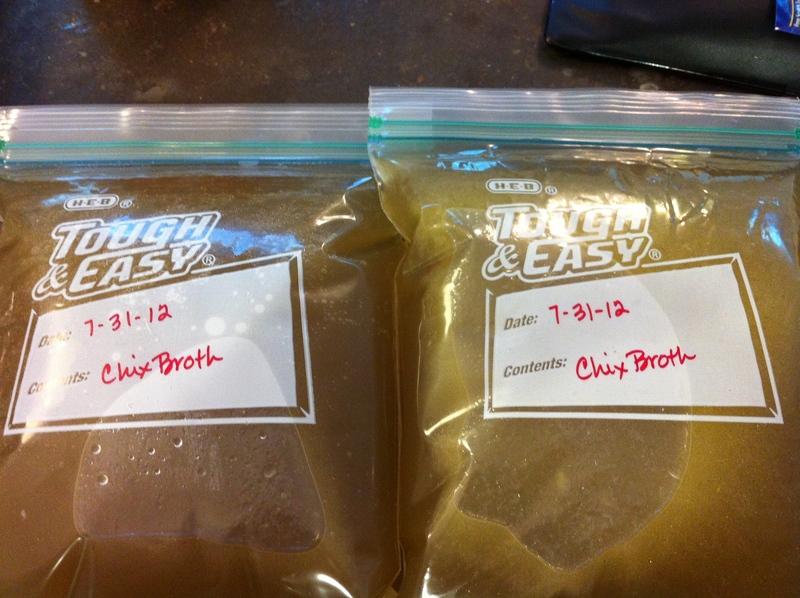 Homemade chicken broth is fairly inexpensive, easy, and, best of all, delicious. You can control the flavor of the stock, make it with all organic ingredients, make it low- or no-sodium. It’s completely up to you. 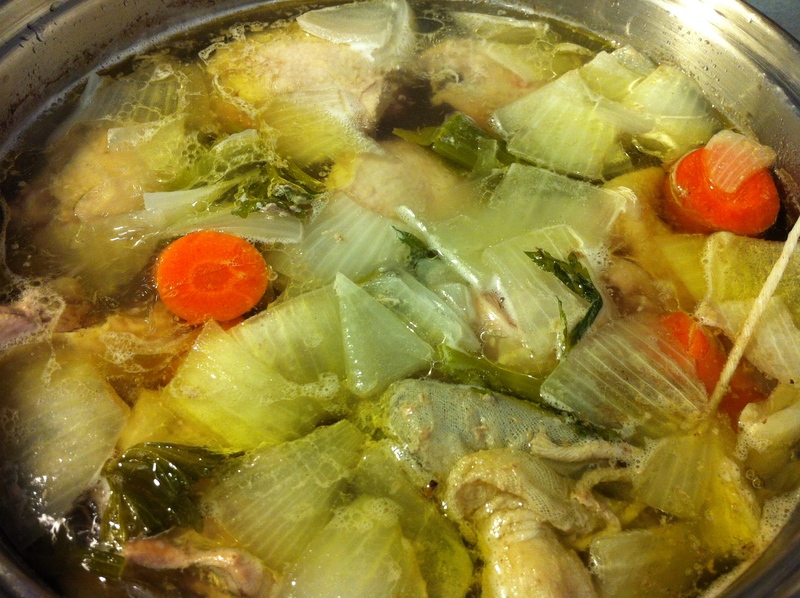 The recipe that I’ll be giving you today is for a traditional white (non-roasted) chicken stock. This means that all of the ingredients are raw when they go into the water. I will preface this recipe by saying that I don’t particularly care for a lot of vegetable flavor in my meat stocks. I save that for my vegetable stock. So, I keep the vegetables to a minimum. Sometimes, I just leave them out altogether. You don’t need to get fancy about chopping the vegetables for this. Just make sure they’re peeled and cleaned. You can simply cut them into large chunks and that will be fine. In fact, I worked with a lady who would simply break the celery and carrots in half and toss them in. No muss, no fuss. Also, I never put salt into my chicken stock. I do this so I can control the salt in the recipe later. One more note about the cuts of chicken. Whole chickens are best. Just be sure to remove the giblets (if there are any) and thoroughly rinse the chicken. Trim as much of the fat as you can (although natural, free range, and organic chickens will have less fat) and, very important, leave the skin on. It has a lot of flavor, just like the bones. I will sometimes use, as I did in this particular instance, chicken thighs either in place of or to enhance the whole chickens. Dark meat has quite a lot of flavor, so I like to add a few extra thighs in. I don’t recommend using all white meat because it just doesn’t have the flavor to make a rich stock. If you’re going to go to all the trouble to make homemade stock, you want it to have flavor. Do NOT use boneless, skinless breasts to make stock. You may as well use water in your cooking instead. 1. 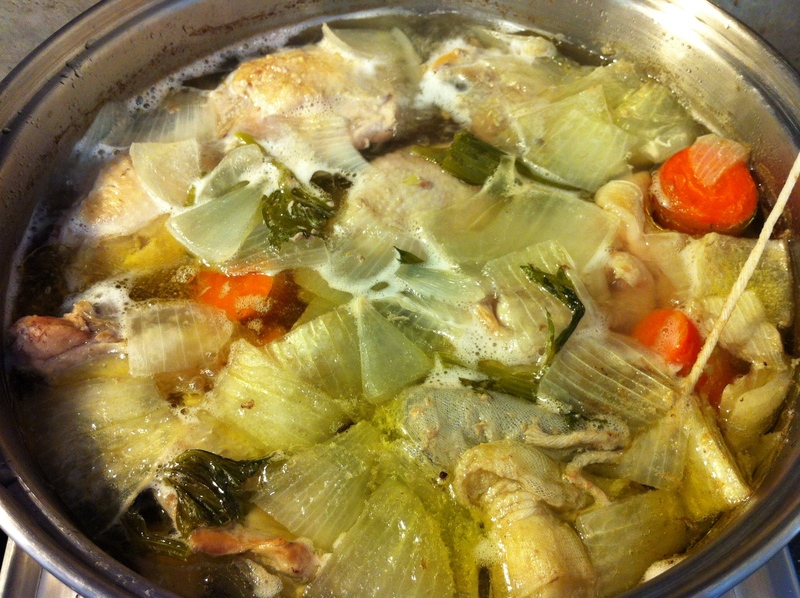 Rinse the chicken (this will help get rid of some of the impurities as well as anything that might interfere with the flavor) and place it in a large stockpot. (You want one that will hold at least 8 quarts). Add in the vegetables and bouquet garni. Add just enough water to cover all the ingredients. 2. 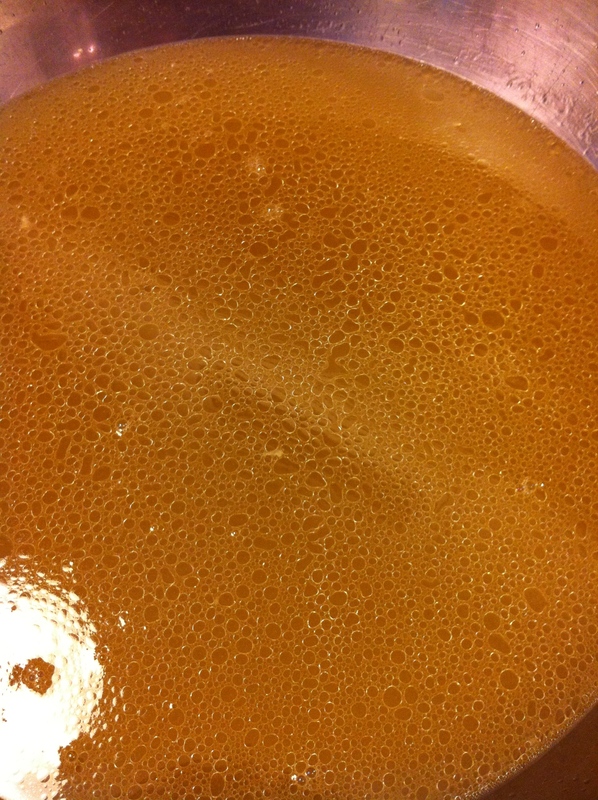 Place the stockpot on medium heat, cover, and slowly heat until you just see bubbles start to break the surface. 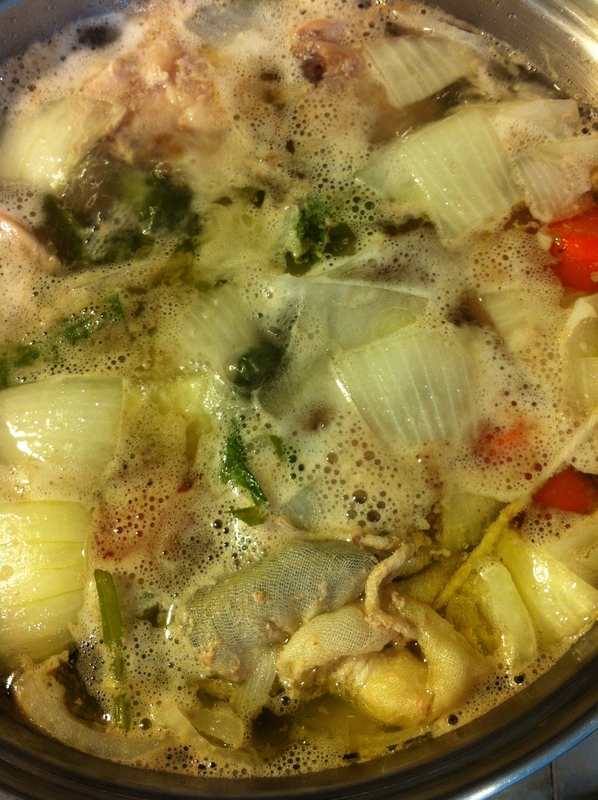 As soon as that happens, uncover the stock, turn the heat down to low and gently simmer. 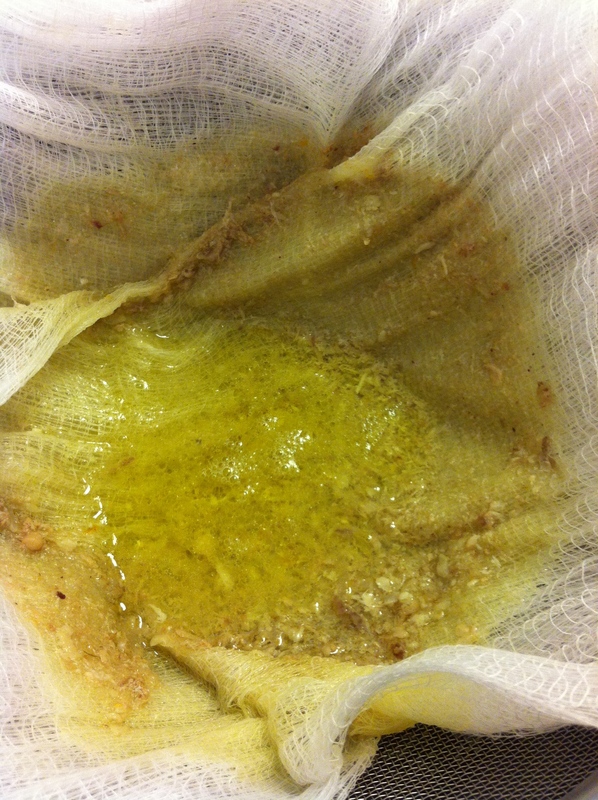 This will help to make a clearer stock as well as give it a deeper flavor in the end. You can just start to see the foam rising to the top. The stock has been cooking for about 20 – 30 minutes at this point. 3. Continue cooking at a low simmer and skimming off any foam for the next 3 hours. Add cold water as needed to keep the ingredients covered at all times. After about 45 minutes to 1 hour. Skim off the foam. After skimming off the foam. At approximately 1 1/2 hours. At approximately 2 hours. At this point, you really won’t see any more foam. Approximately 2 1/2 hours. Add more water if needed. At 3 hours. Notice how the ingredients have cooked down. 4. At this point you can do one of two things: either strain the stock and get it ready for storage; or, store the stock as is, overnight, in the refrigerator. I tend to do the latter. Ideally, you can quick-cool the stock by filling your sink full of ice, placing either the stockpot or a bowl with the strained stock in the ice. Stir frequently until the stock is cooled to room temperature (replenish the melted ice as needed). At that point, either store the stock overnight in your refrigerator or store it into serving- or recipe-sized portions and put it in the freezer. 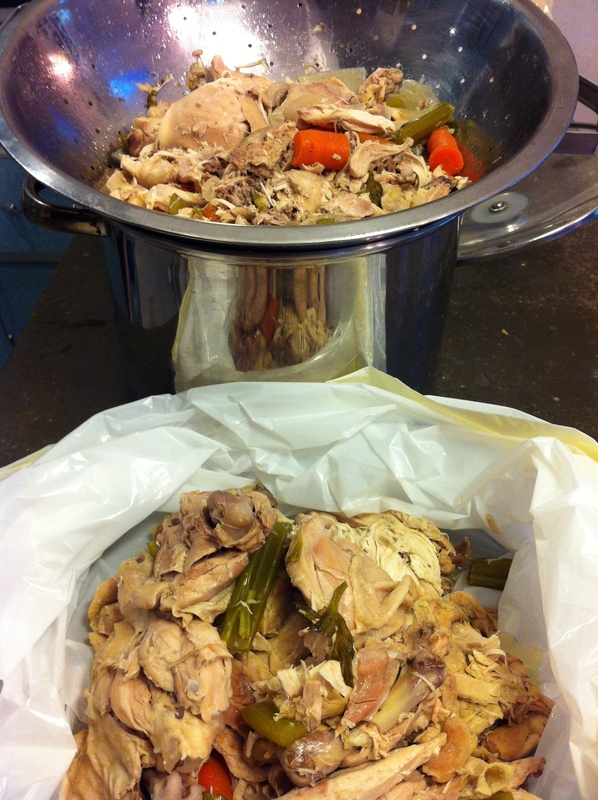 In France, and probably other parts of Europe, stock is left to sit on the stove overnight. I don’t recommend that. Be sure to cover your stock if you store it overnight. 5. 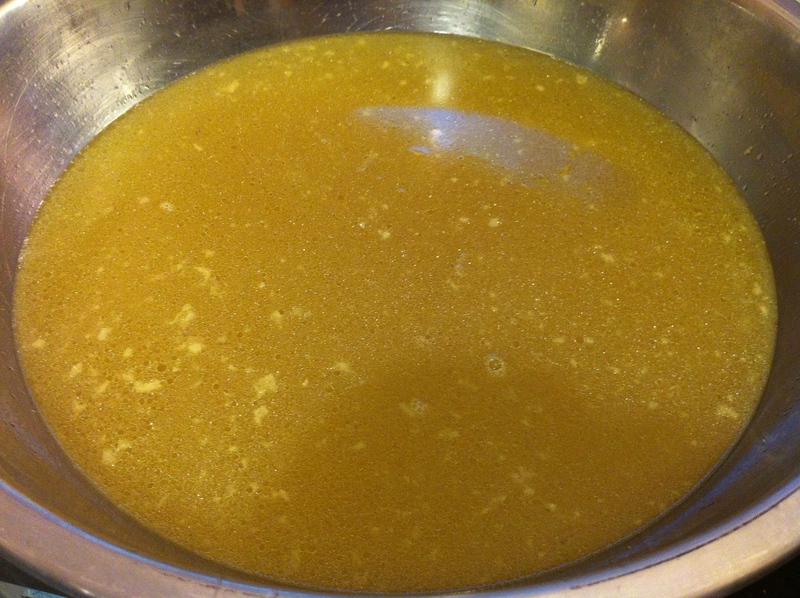 If you let your stock sit overnight, you can remove any fat that has hardened on top before you store it. However, if you’ve trimmed the chicken before you started, there shouldn’t be too much fat to worry about. But, it’s up to you. Stock after sitting overnight. I left the ingredients in to continue adding flavor. 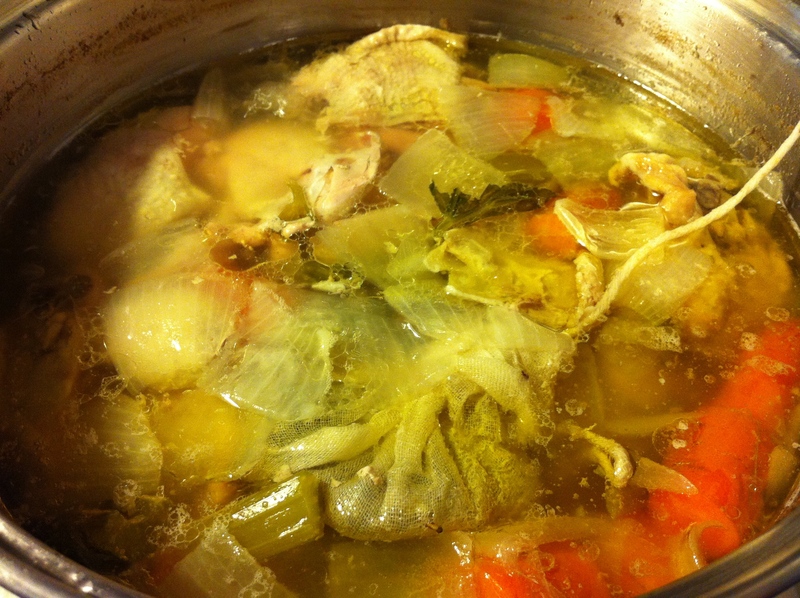 However, if you want to strain the stock before cooling, go ahead. Ideally, you want your stock to look like, well, jelly. Meat jelly. This happens when you have extracted all possible flavor from the ingredients and you have cooked the collagen out of the bones and skin. It’s what gives the stock a silky mouth feel and richness. 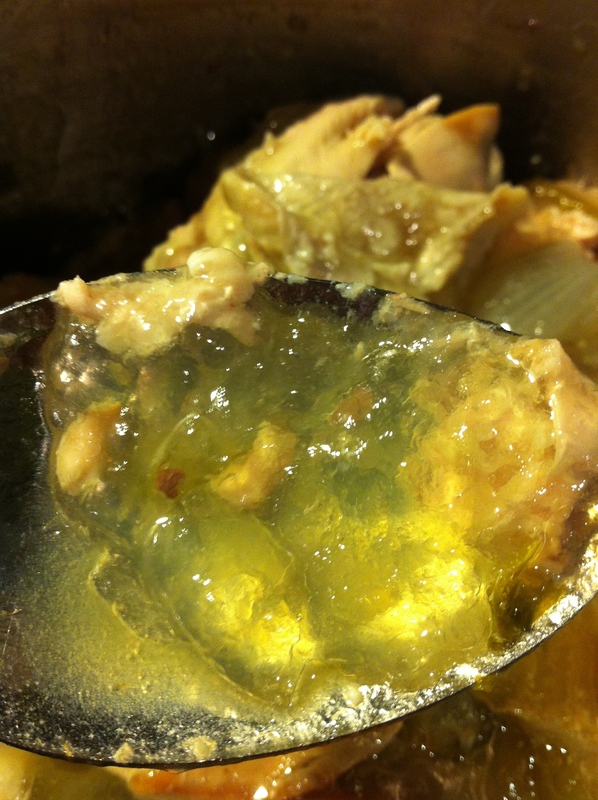 Mmm… Chicken Jelly. Seriously, this is what you want to see. 6. If you have already strained your stock and are ready for storage, go ahead and do that. However, if you’ve store your stock overnight with the ingredients still in the broth, then, you’ll need to reheat the stock over low heat until it just becomes liquid again. 7. Strain the stock. 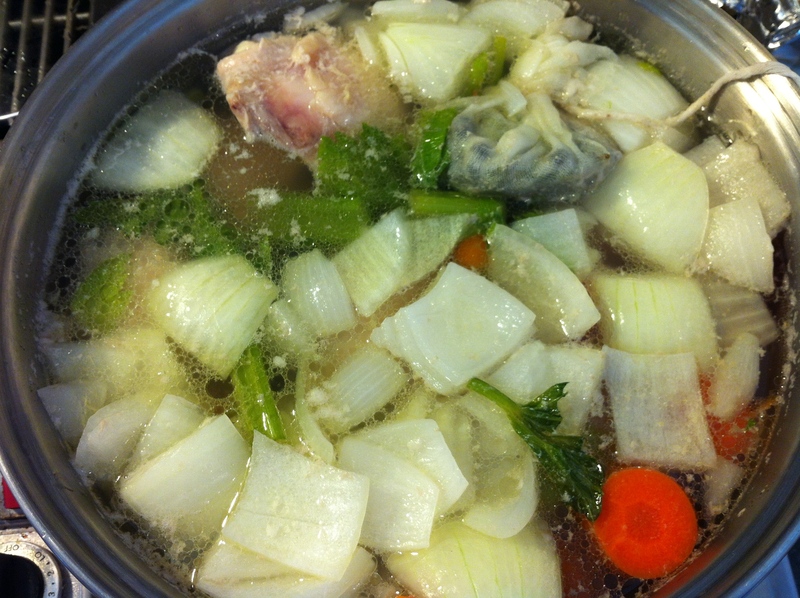 I’ll remove many of the large pieces of chicken, vegetables, and the bouquet garni from the stock before I start to pour out the liquid. Saves on splashing messes. Be sure to let the anything you remove from the stock drain thoroughly before discarding them. 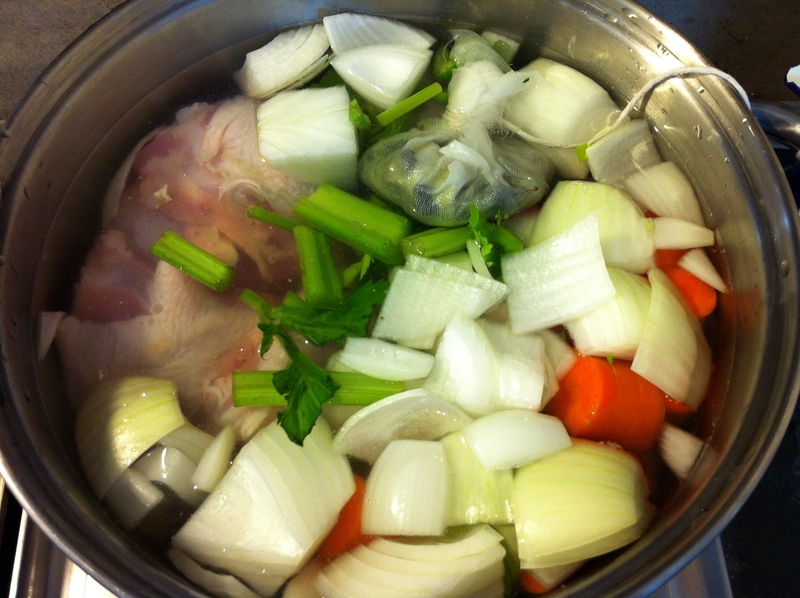 Take a large colander and pour the stock through it into a large bowl or clean stockpot. If you’ve done this right, the chicken or vegetables won’t have any flavor once you’re done, so they can be discarded. First straining of the stock. Stock after the first straining. Now, at this point, you can do one of three things: a) stop straining and store the stock; b) you can cook it down a little further to concentrate the flavors as much or as little as you like; or, c) strain the stock a second time to clean it a little more. I like a richer, clearer stock, so, I went with (b) & (c). 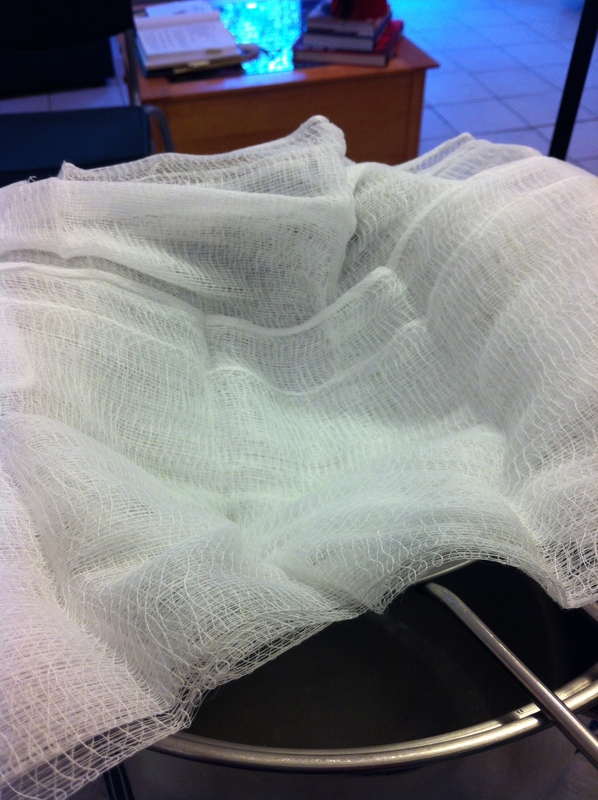 Take a fine meshed strainer and line it with several layers of cheesecloth (available everywhere) or a flour sack towel. Place the strainer over a bowl or stockpot and pour the stock through. This will catch any last bits bone, meat, vegetable, etc. that wasn’t strained the first time around. 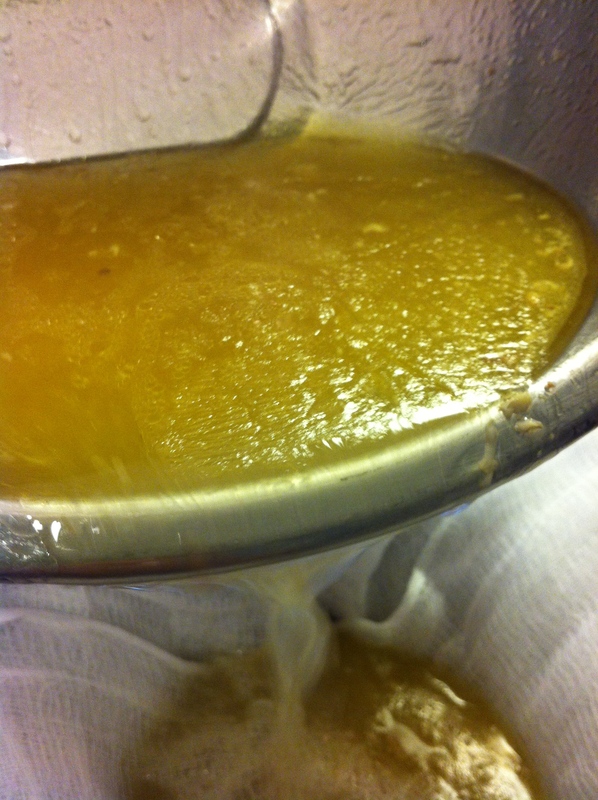 Pouring the stock through the cheesecloth. What’s left after the second straining. A little chicken, a lot of fat. I have literally seen chefs dip bread into this. 8. 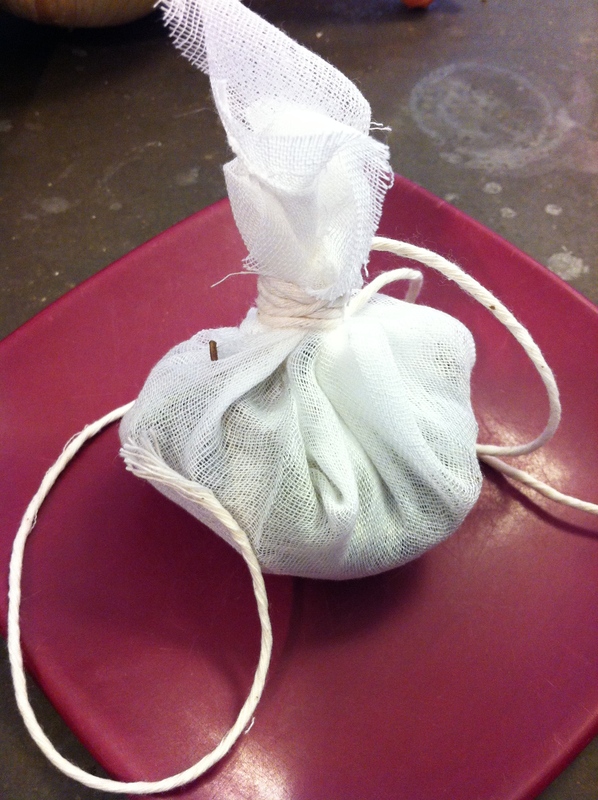 I’ll measure my cooled stock into quart-sized zip bags. It’s almost always the amount I’ll use and that way I’ll only have to take out what I need. You can measure out however you like; but, I highly recommend portioning it out. Stock ready for the freezer. I’m reluctant to give you an exact amount this recipe will make because it’s a little different for everyone. Because I cooked this down a bit, I ended up with 2 quarts of stock. 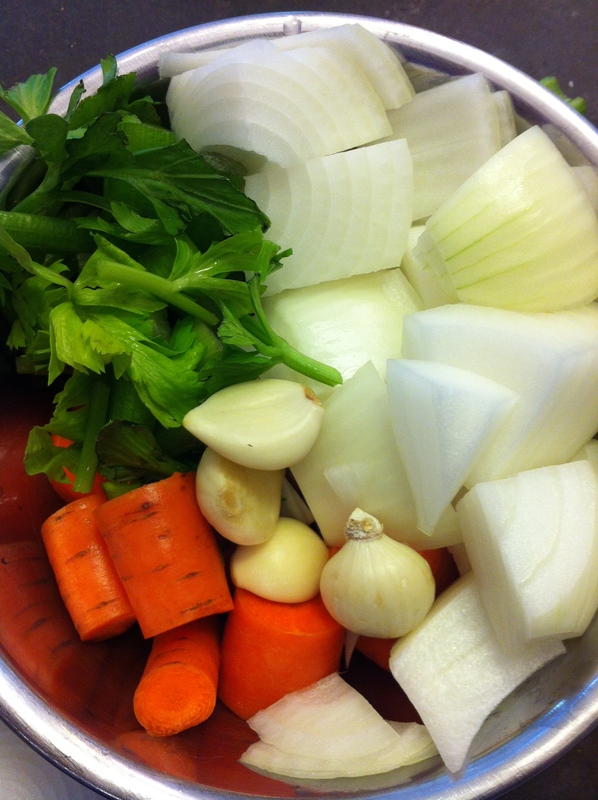 However, you could have up to 4 or 5, depending on the size stockpot you used and how much your stock was cooked down. Always label and date your stock. It will keep for up to 1 year in the freezer and 3 days in the refrigerator. p.s. 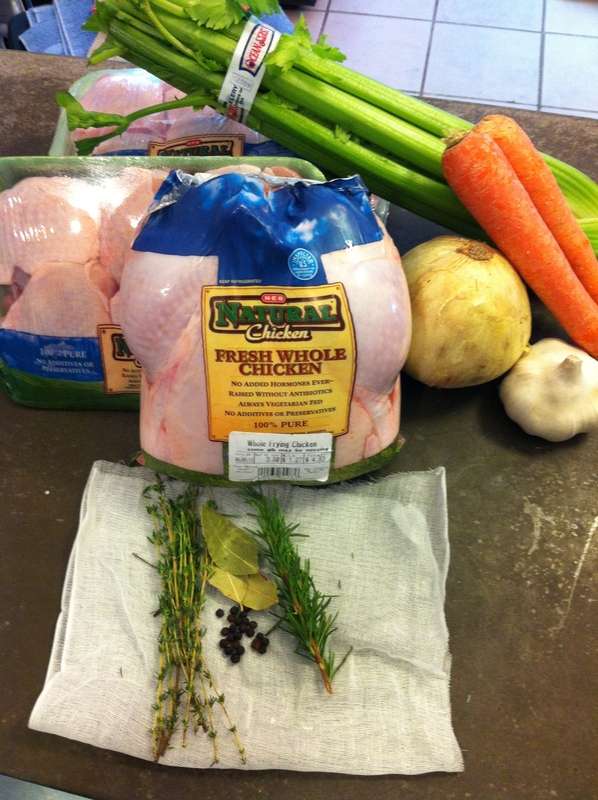 I’ll be teaching a class on chicken at Central Market, 4001 N. Lamar, in Austin on Friday, August 24. If you’d like to see more lovely chicken recipes, sign up soon!